"Do you know how to play at least one musical instrument? Did you play one when you were growing up? According to neuroscientists, musical training offers more benefits to the brain development of a child." according to Audri Taylors, UniversityHerald Reporter. Learning musical instrument is actually more beneficial than most people realize, as studies suggest that it can boost a person's brain power, here's how. Even children who did not have any experience of playing musical instruments have shown a significant boosted connections right after 9 months of practice. According to research, musical training can even help in the treatment of certain brain development conditions such as autism. This is the focus of the study of the researchers from the Hospital Infantil de México Federico Gómez in Mexico City. 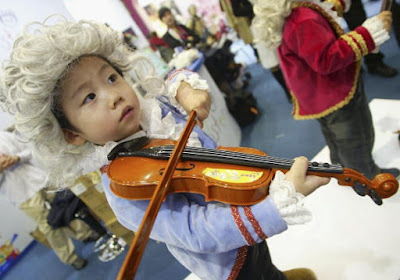 They conducted a study among children aged 5 to 6 six years old with no musical training. Each of them was given a brain scan using a so-called DTI (diffusion tensor imaging) to scan the brain's white matter, called axons. Axons are the nerves that connect with the other regions of the brain. Dr. Pilar Dies-Suarez, lead author of the study, said: "Experiencing music at an early age can contribute to better brain development, optimizing the creation and establishment of neural networks, and stimulating the existing brain tracts." These children were given nine months to learn musical instruments before they went through another DTI scan. After the scans, it was found that there was an improvement in the movement of the water molecules in the child's brain, and an improvement in the length of the fibers. The movement of water molecules along the brain fibers can help indicate whether the child has brain development problems.